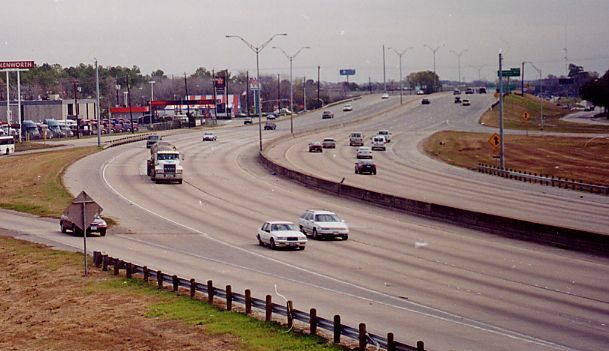 Loop 610 is Houston's 38.3 mile inner loop that was completed in 1975. This page focuses on the north, east, and south segments of the loop. The west loop is far more glamorous than the other segments of the loop, but is also much more traffic congested. Two sections of the Loop have been reconstructed and expanded since the original construction. The southwest segment from 288 to the southwest corner was expanded to 10 lanes in 1995. The segment between IH-45 north and US59 North was expanded to 12 lanes to handle traffic coming off the Hardy Toll Road in about 1987. The rest of the freeway is in its as-built configuration, which is 8 lanes for the north and south segments, and 10 lanes for the east loop. 1941 Alignment for the north loop is approved. 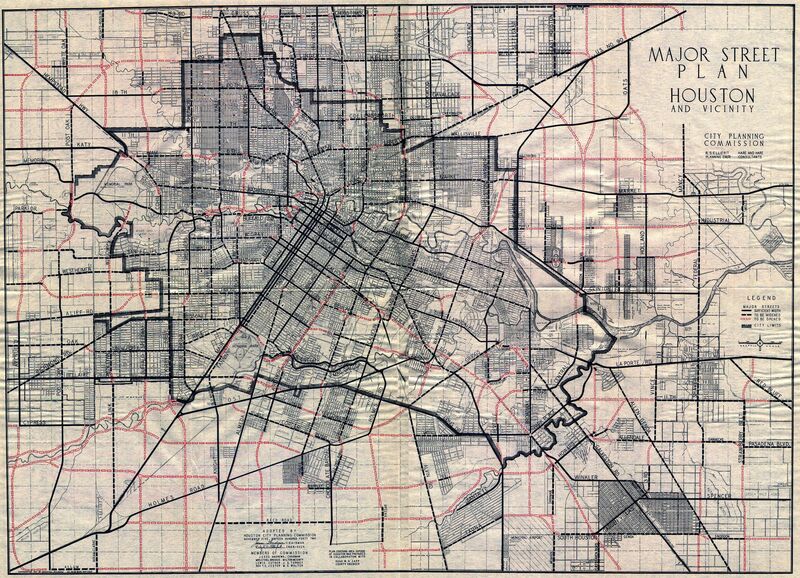 1942 The so-called "Defense Loop" appears on the 1942 Major Street Plan for Houston and Vicinity. Right-of-way acquisition was underway for the north segment. Loop 610 followed the planned 1942 alignment, except for the southern segment. 1946 Planning for the full loop (minus the eastern segment) is underway. The facility is designated as Loop 137. 1956 The Interstate System plan includes a "C" shaped loop 610, excluding the eastern segment between IH-10 east and TX225. 1962 The east segment and the ship channel bridge is added to the official plans. 1965 The Astrodome, the world's first indoor stadium, is completed on the South Loop. 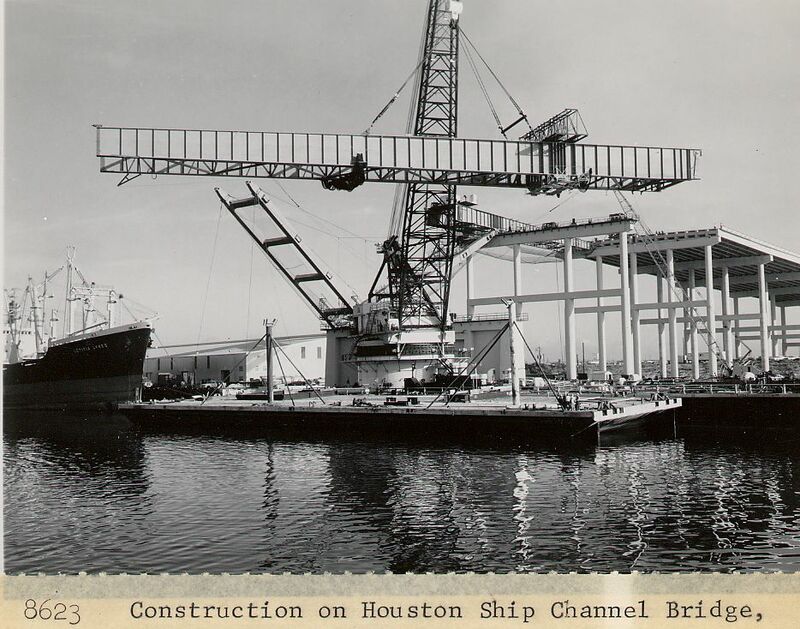 1973 East Loop, including the ship channel bridge, is completed. 1975 The entire freeway loop is completed. The final sections include the northeast section from Hardy (now the Hardy Toll Road) to IH-10 east, and the main lanes through the IH-45 south intersection. Approx 1987 The north section of the Loop between IH-45N and US59N is widened to 12 lanes to accommodate traffic coming off the newly opened Hardy Toll Road. 1995 Widening of the western half of the south loop (288 to southwestern corner) to 10 lanes is completed. 2002 The new retractable roof football stadium, Reliant Field, will open, adjacent to the Astrodome. The future of the Astrodome is uncertain. If a use cannot be found, it may be destined for demolition. 2002 Construction is scheduled to begin to upgrade the East Loop/IH-10 interchange to make connections to the new Northeast freeway, which will begin at the East Loop/IH-10 interchange. 2010-15? A five level stack is planned at the interchange of the South Loop and the future TX35 freeway. It remains to be seen if the full interchange will be constructed. As of late 2000, the 35 freeway has not been funded. As of early 2001, there are no major expansions or construction projects planned for the north, east, or south sections of Loop 610. The potential 5-level stack at the still-to-be-constructed 35 freeway is in the distant future. 610 as it crosses the Houston Ship Channel. Bridge Clearance is 135 feet (41m), unusually low for a major crossing (newer crossings are 175 feet (53m) or higher.) 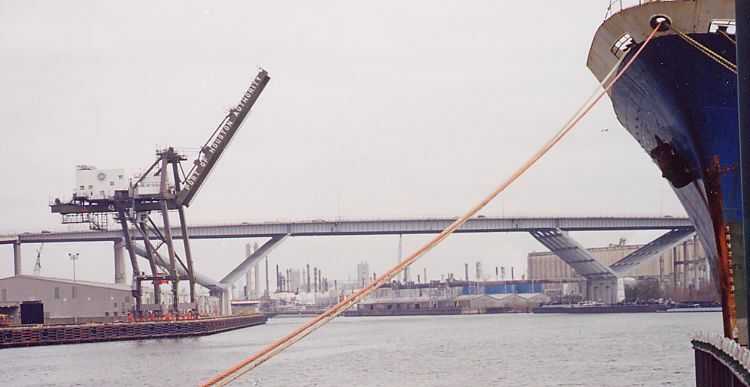 Just days before this photo was taken, a ship's crane collided with the bridge deck and knocked out a large hole in the pavement, forcing the closure of 3 northbound lanes. This view looks east. Historic construction photos. Looking south along 610 with the ship channel bridge in the background. The Ship Channel Bridge has 10 lanes. The four-level stack at the intersection of the East Loop and IH-10. This stack was completed in the early 1970's. Aerial view of the interchange at the East Loop and IH-10. 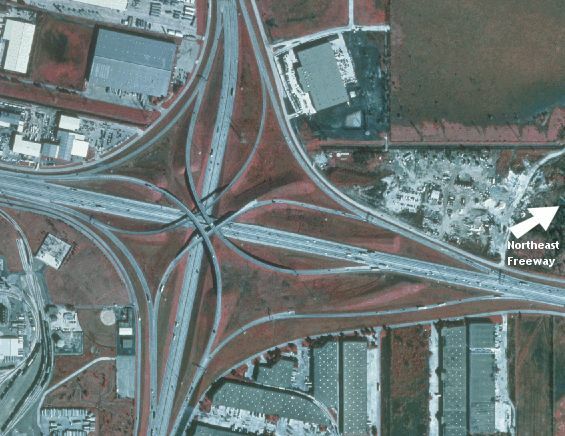 If you look closely you can see the stub-outs and embankment for the future connections to the Northeast Freeway, which will begin at this interchange. Construction on the connections to the future Northeast Freeway is scheduled to begin in 2002. This aerial view was taken around 1996. This is a typical section of the northeast section of Loop 610. The freeway has 8 main lanes plus feeders. This was the last section of the loop to be completed in 1975. This view looks east. The North Loop between the Hardy Toll Road and IH-45 north. This section of freeway was expanded to 12 lanes around 1987. View looks west, towards IH-45. Photo taken September 2000. This view looks west along the south loop near the southeast corner. This section of freeway was reconstruced and widened to 10 lanes in 1995.